The S. S. Peralta was an oil tanker built by the San Fransisco Shipbuilding Company and launched in February of 1921. She is the sister ship of the Palo Alto. In 1924, the Peralta was purchased and converted into a sardine cannery in Alaska. 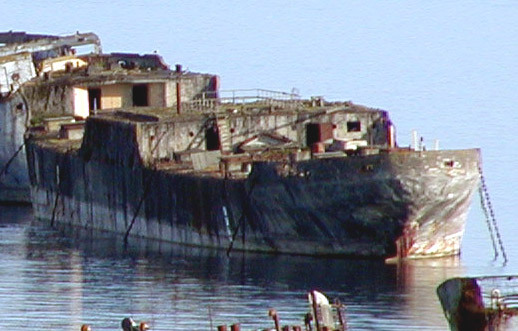 24 years later, the ship was moored off Antioch, CA. Finally, in 1958, the Peralta was purchased by Pacifica Papers to be used as part of a giant floating breakwater on the Powell River to protect its log storage pond. She floats aside several of concrete ships built during World War II. The Peralta is still afloat as part of a breakwater for a pulp and paper mill in Powell River in British Columbia, Canada. She is the last ship of the World War I fleet still afloat. At 420 feet, she is also the largest concrete ship afloat. In December of 2000, the mill was downsized as the result of a corporate merger between Pacifica Papers and NorskeCanada. The mill no longer processes raw materials, so they were planning to remove a few ships from the breakwater. There was discussion of sinking the Peralta as an artifical reef; however, the company changed its mind and decided to keep all ten breakwater ships. The Peralta is safe for now. Dimensions: 128.02 meters x 16.46 m x 10,67 m.
Engine: T.3-cyl., 359 nhp, Llewellyn Iron Works, Los Angeles, 1 screw.